I have looked at tens of thousands of wedding photographs over my twenty years as the owner of Headpiece.com. On occasion, I come across a photographer who stands out and reels me into their wedding world of unpredictable snaps. Michael J. Ramos is one of them. He provides the perfect shot! 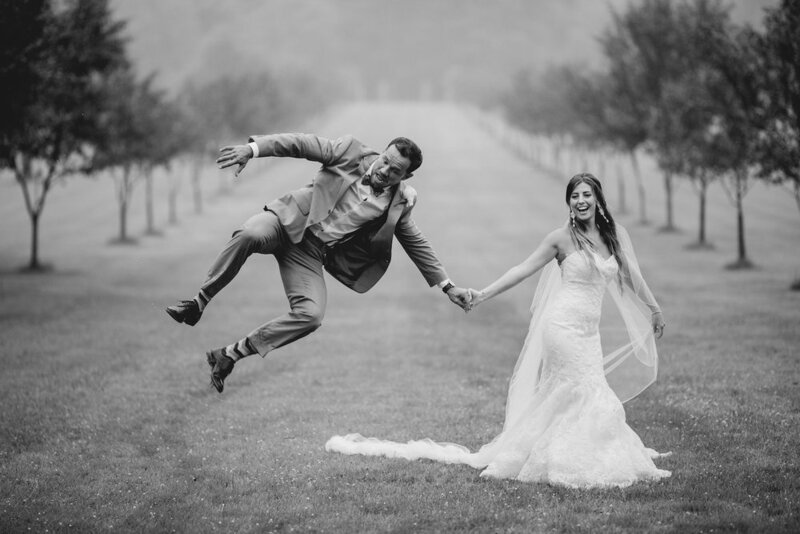 I became an early fan of Michael J. Ramos when he shot the wedding of one of my brides, Shayna Volpe, in November of 2013. I was happy to hear that my client, Rachel McKnight, chose Michael J. Ramos Photography for her wedding. Rachel was ahead of the fashion curve asking us to design her dramatically long veil at 146” in June of 2015. I knew Michael had a unique perspective when I saw how he photographed Rachel’s veil — and in the rain too! In 2015 it was uncommon to see a wedding photographer focus on the beauty of a bridal veil. My client, Laura Paruta, came to Headpiece.com wanting to wear a cathedral veil but was feeling hesitant because of her petite frame. She told me Michael Ramos was her photographer. I was confident that I could design the perfect veil that wouldn’t overwhelm her, and that Michael would know how to photograph it. Michael went to school for marketing but fell in love with photography. 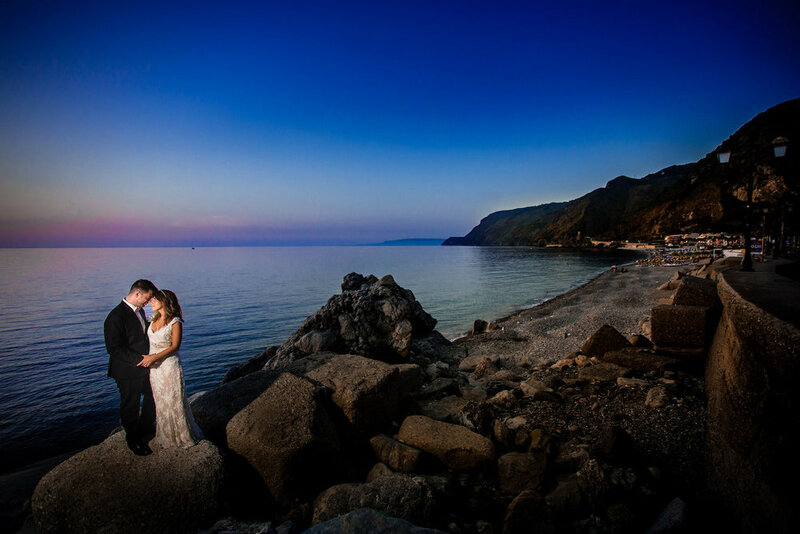 He has been a professional photographer for eight years and traveled to Italy, Greece, Jamaica, Mexico, and the Dominican Republic to shoot some of the most luxurious weddings! Michael’s customers seek him out not only for his contemporary photojournalistic style but for the experience of his shoot. 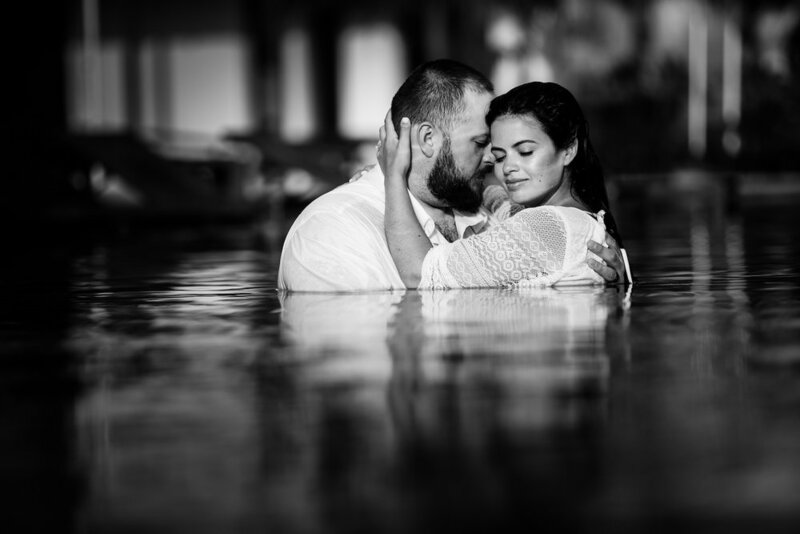 He is known to go above and beyond for his clients, and this allows for fluid shooting creating a comfortable environment that makes the session effortless. 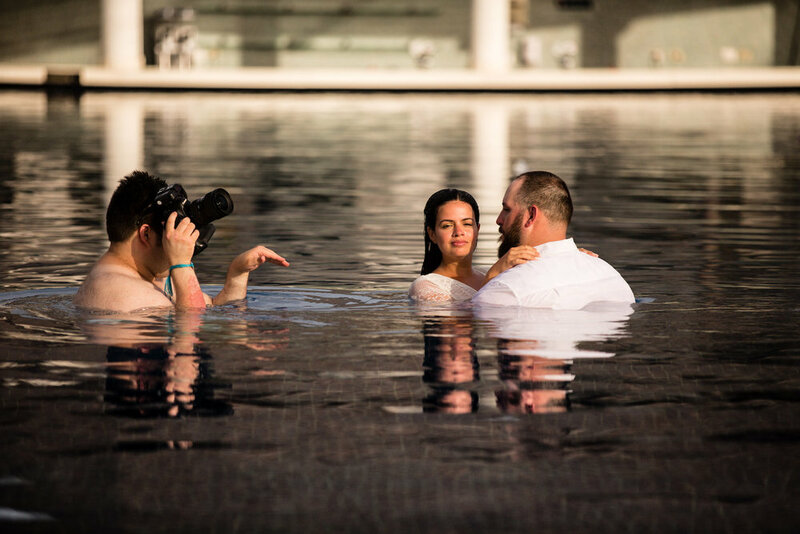 In Jamaica, Michael joined this couple in the pool at 6 a.m. only to get a better angle. My admiration for Michael’s work grew. I hoped one day we would have the opportunity to work together, but we didn’t even know each other! After working with my brides, Michael began to admire my work and noticed the difference between my individually designed pieces and those bought off the bridal salon rack. After years of following each other's work, we connected on Instagram and decided to put our talents together and do our first collaboration. The rewards at the end of a photo shoot can be exhilarating. The work and preparation to get to that point can be exhausting. This photo shoot was planned months before the February 24th shoot date. I coordinated a top-notch team that shared my vision. Gowns needed to be chosen and fitted for the model. Three weeks before shooting I began my work to design accessories specific for the look and feel of the photo session. A group of people who fluently perform their craft were ready to be on set with Michael J. Ramos. Lia Zangari, owner of Bliss Salon, set Aubrey’s hair for her masterful down-style while Justine artistically prepares our model for the camera. Lia and I have referred many clients to each other. We can discuss hairstyles and bridal accessories and know precisely what we want the outcome to be. There is something incredibly unique about our combined talents and vision. When we work on a model together, our hands move in sync. Park Chateau Estate and Gardens is a breathtaking venue with many beautiful architectural details. We could shoot there for days if permitted. Any bride who marries here will feel as though she is in a dream on her wedding day. I will be featuring two of my brides in an upcoming blog who were both married in The Chapel at Park Chateau. I love working with my brides and designing something beautiful for them. I often think of them at the start of their ceremony. I wonder what they are feeling and how pretty they look. It is the only downside to my work that I don’t get to see them walk down the aisle. Shooting Aubrey in the chapel, in my gorgeous lace veil designed to compliment Lea-Ann Belter’s “Treasure” gown from her Astrid and Mercedes collection put me in a place where I could imagine my brides as they begin their walk. 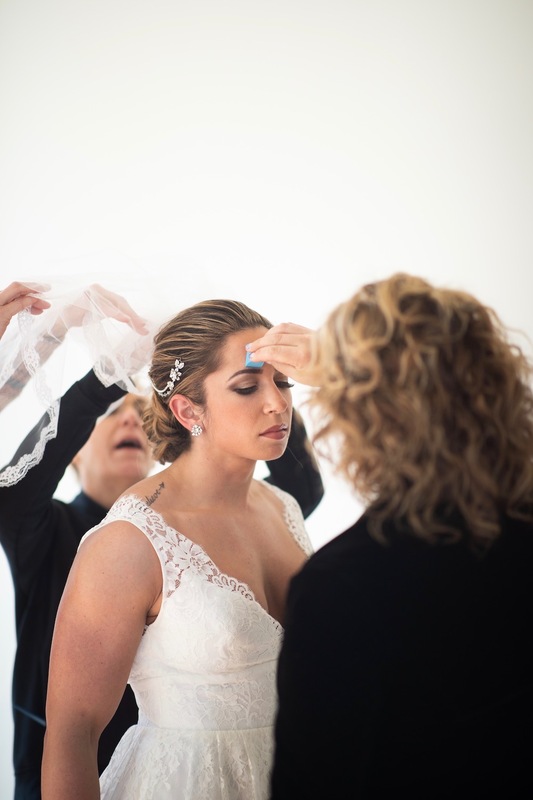 The hairstylist and makeup artist are consistently watching in-between sets to make sure beauty is in check for all lighting and temperature change. Their part during a photo shoot is essential to a successful outcome. Our time was nearing an end. Michael and I had so many more ideas we wanted to shoot in the incredible spaces of Park Chateau. Michael grabbed Aubrey and said, “I just have one more thing I want to do.” He took her to the Groom’s Suite for one more quick set. The day was over. I felt kind of like how a bride feels after a year of planning and then the wedding day is over in a snap. The only difference is I can do it all over—-again and again!